Posted: Mon Mar 06, 2017 1:00 am Post subject: Wiring diagram for alarm on early 996 for wake up signal?? After a week-ish my 1997/8 996 alarm goes to sleep, as normal. However, I cannot wake it up without the alarm/horn sounding. So it's time to fix it. If anyone can point me in the right direction with wiring. I believe that the alarm ecu is looking for a signal from turning the key in the door lock switch. This then wakes up the alarm so that the remote then responds. Any clues to checking the wiring will be greatly appreciated (by the neighbours too). Can you lock/unlock the car using key? Can you raise/lower windows using the key? Does your windows operate correctly drop/raise when the door is opened/closed? Yes. Can lock/inlock with key. Instantly sets alarm/horn going if asleep. Windows open/close by holding key barrel fully locked/unlocked. Not tried. Yes. Windows drop when handle lifted. Yes. Global opening/closing of the windows from the door lock works perfectly. From what I have heard on here. I'm meant to be able to silently wake up the alarm ECU which then allows me to open the car via remote, simultaneously disabling the alarm as normal. I've heard different ways. Lift the handle. Tried that. Turn the key anti-clockwise. Tried that. Clockwise. Tried that. Can't think of any others. Yes. Tried it on one leg. I'm guessing I need to find the signal/pin location of the wake up request on the alarm ECU. Then I can check it. Could be a broken wire in the door loom? Incidentally, my drivers mirror does not work via the motor/switch. Passenger side is fine. 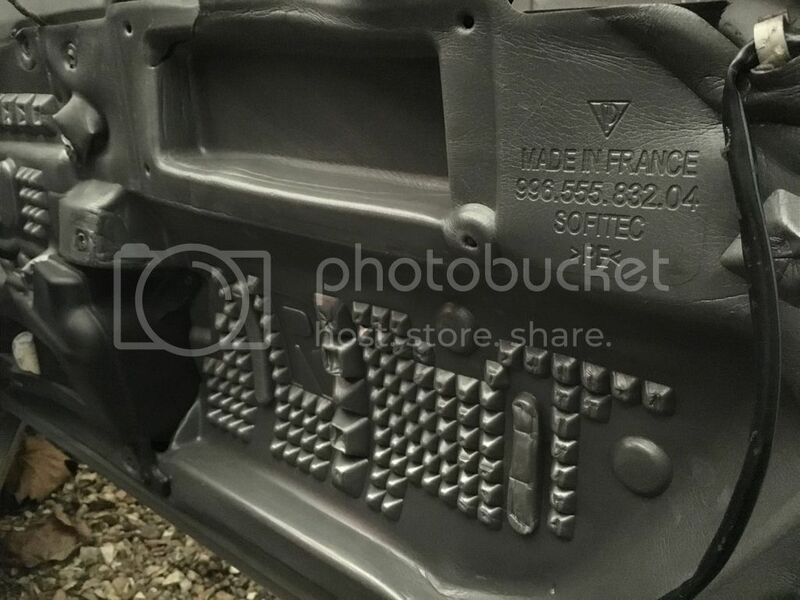 When I strip the door panel, I will look at this too. Maybe connected???? Broken wires??? Corroded multi plug????? I use the car at weekends and it's asleep by Friday. So bloody irritating. Im no expert on this but as far as i know then when in sleep mode you can unlock the car with the key and you have 10 seconds to turn the ignition on before the alarm triggers , if it doesn,t do that then it suggests a fault . Best guess is a fault in the drivers door lock that is not registering the door being unlocked .. micro switch im thinking and so it only sees the door being opened . I would normally have a tester on said vehicle to check the values of the switches to diagnose it . Wiring diagrams here might help if you dont alreay have them .. I've looked at the factory manual (on the page you sent me). So I should have 10 seconds to switch on the ignition. Nope. Instant horn & lights flashing. Interior lights flash too. Like a cheap night club. Can this entry time be adjusted I wonder? Its not adjustable but you do have a fault if it triggers instantly , in the lock there are about 4 micro switches , my guess is the lock one is not working and thats why the alarm triggers when the door is opened . Only way i know of checking is with a tester and we look at the values of the switches , we would then lock the door and see if they alter basically . 996 / 986 door locks are also a pretty common failure these days .. been a few posts recently about people taking them appart and resoldering the connections .. dry joints . The alarm sounds the second I turn the key. I'm guessing there should be a micro switch that signals that an approved key has turned the barrel. This would then activate the 10 second count down. However, I think mine just operates the door solenoids (similar to them being forced or operated through an open window) therefor causing instant alarm. I'm struggling to locate a wiring diagram for a 97/98 996. Your suggested list shows a 99/00 996 model but I'm sure they changed a few alarm functions. Im afraid thats the diagram i use when helping out here , its going to be similar if not the same , there are some changes on diff model years but im of the opinion the alarm system is the same , cant prove it as off off work atm but thats what i think . 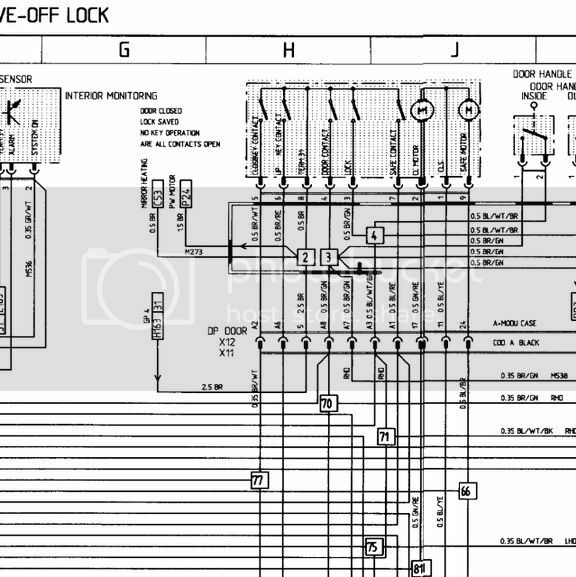 On the diagram it shows a key lock contact , thats the bit that needs checking , the key will also operate a push rod to open the door , my guess is its that bit that is tripping the alarm .. may be voltage sensing or just the operation of a diff switch .. its one of those jobs thats easier to diagnose when looking at the car with a tester than here im afraid. Again a quick ish check would be to swop out the door lock with a spare .. again easy for me as we stock them and its often quicker just to do something like that rather than trying to pin out all the wires just to check it . Need to think of what else it could be and to be honest i cant think of anything else , the door lock tells the alarm cu whats going on .. alarm just reacts to voltage or switches being altered .. you have a durametric ? need some sort of tester really i think or we are into just changeing the lock or finding the wire colour / pin no. at the alarm cu and checking that for switching .. probably going to be an earth switch .. most things are . Now on mine you could open the car with the key then there was a delay to enable you to turn the ignition on before the alarm sounded (the horn actually) but I changed the ignition switch for a new one and if I leave the car for a few days the remote doesn`t function but now if I put the key in the door lock and turn the key the alarm sounds until I turn the ignition on then it is silenced and remote works again. So either something has changed because of the new ignition switch as the alarm set is connected to the ignition being turned off ie. when you turn the ignition off it allows you to lock the doors/set the alarm with the remote if the ignition switch doesn`t feedback to the system the remote will not work or its just coincidence that something else has changed. I'm a trained tech so I have a few Fluke meters knocking about. Sounding more like a micro switch or poor connection. Will get the door panel off. Signal to pin 3,4,5 & 6 all check out & operate as expected. Pin 7 (safe lock) I'm assuming is a dead lock signal. So I can't really check this on the bench. So I'm happy with lock operation. Does anyone know what signal (especially) that the Ecu is looking for to start the 10 second countdown? 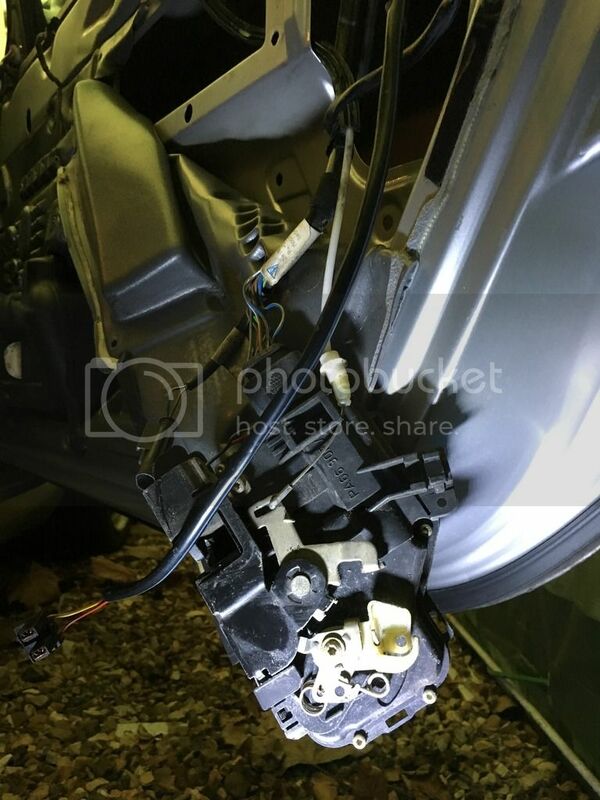 The repair manual indicates that you manually open the door (which will naturally send the unlock signal, unsafe signal, door open signal in that order). It must be expecting these if you are meant to operate the ignition key within 10 seconds. Please help. I hate being beaten. I checked mine again and with the car locked with the remote active ie not in sleep mode you can open the door with the key and put the key in the ignition the transponder in the key head is recognised by the receiver in the ignition so turn it on and all is OK ie there is no alarm - if you don`t put the key in the ignition the system beeps twice to warn you the alarm is going to sound which it does unless you turn the ignition on so everything is working as it should then if you remove the key and close the door and use the remote the door is not locked and the alarm is not set until you use the remote again (2nd time) which locks and sets the alarm after which the remote works as it should. 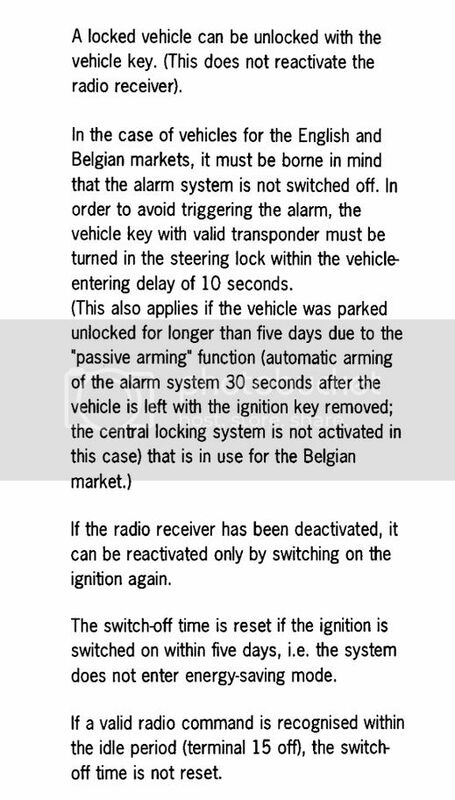 But it seems that if the system doesn`t receive a signal from the remote within 5 days the remote is not recognised and you unlock the door with the key then open the door the alarm sounds until you turn the ignition on to cancel the alarm then use the remote as above and it should be back working again. Ok , from looking at the diagram then 2 switches seem to be used to tell the alarm cu the key is either locking or unlocking the car ..
That seems to be pins 5 and 6 on the door lock and you will get an earth switch on these depending on which one is operated ( key lock or unlock ). Your testing the lock out of the car i assume , ok a meter will tell if you have a contact but if its resisted ( burn contacts ) then it will not give the correct earth to the alarm cu .. i prefer load testing a cuircuit before saying its fine and moveing on . I think if it was me then i would be testing this at the alarm cu itself .. 2 reasons , 1 being i could check the alarm plugs for corrosion or water ingress / corrosion inside the alarm cu itself and the second is to prove the alarm is actually getting a good earth as theres other connection points in the system that might be at fault . If you get an earth at these then it proves the entire key lock switching . From the diagram then i would say its plug 1 and pins 15 & 35 , bk/wt and br/rd . How to check though .. a little tricky , if the wires are connected to the alarm cu then you might get a feed back which would give you a false reading .. i think either cut or unplug them at the alarm cu and then test .. you can always solder wires back together if you do cut them . Dont disconnect an alarm cu unless you have the ignition on or it will trigger , disconnecting the battery first is best though . 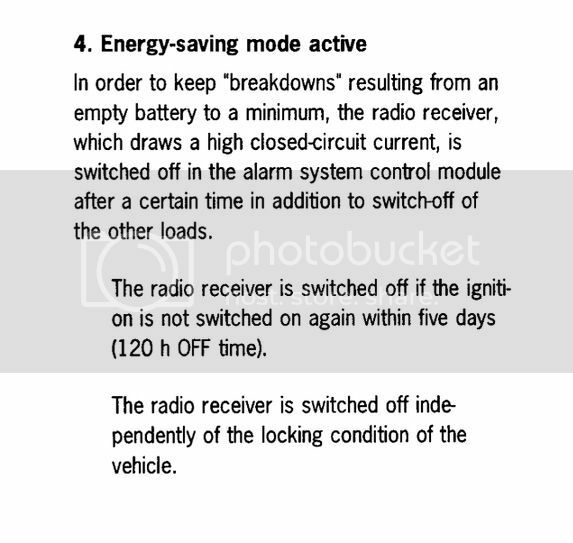 The timer will just be a chip in the alarm cu , it will see the car has been locked with the fob and then unlocked with the key then it will start a count down .. thats how i see it anyways but not something ive ever needed to test .. there are not relays etc etc for it though if that was what you were thinking . If this gets too difficult on here then pm me and ill send my number .. its hard with this sort of thing to answer by messages lol . Just a quick btw but if you use a razor blade on the membrain glue you can gently cut the membrain off enough to gain access and then reuse it . As a temp fix I'm going to add an alarm horn cut out switch in a secret but accessible place. At least this way I can wake it up quietly until I work out the issue. Door lock is the most obvious fault for this although it seems not this one .. It can be checked pretty easily though with a garage putting a tester on it and looking at the alarm actual values .. I would think at my garage you would be looking at 0.5 hrs labour for this . tester can also see what has caused the last 10 alarm triggers and the last 10 faults when the car was locked , which again would be in the cost above to check . so you need to check the wiring from the doors is correct on the input to the alarm. One day I will get around to swapping mine.